V7(2017) is actually a newer version than V8(2016). My only problem is the Animal one does't come with the fluffy hard floor head. Why is this not hotter? Is this suitable for carpets ? Like the OP, I'm waiting for a good price on a V7 that has the fluffy hard floor head! Like the OP, I'm waiting for a good price on a V7 that has the fluffy hard …Like the OP, I'm waiting for a good price on a V7 that has the fluffy hard floor head! Does the v8 head fit the v7? I believe so. But not 100% sure. However V6 heads are definitely different. V8 has got a longer battery time in standard mode than the V7 or V6. However, all those models in max mode have pretty much a similar run time. V8 has got a post motor HEPA filter, V7 doesn't have. Is there anyway to turn suction down on either model? We have a Lino floor in the kitchen although well stuck down it doesn’t need much suction to hoover the bits up and I don’t want the floor to start lifting. Is there anyway to turn suction down on either model? We have a Lino floor …Is there anyway to turn suction down on either model? We have a Lino floor in the kitchen although well stuck down it doesn’t need much suction to hoover the bits up and I don’t want the floor to start lifting. You could leave it permanently blocked! How long does the v7 battery last? I have one, heat added but after the initial excitement of how good it does the job the battery performance is annoying. I bought knowing the battery life so thata life. Interesting Dyson limited to warranty from 2 yrs to 1 yr yet the product was only launched in April '17 yet even a 2nd hand unit would have 1yr and 5 months if purchased at launch. Had mine today, could easily pass for brand new. The battery goes a bit further than I thought as it is trigger operated and so is switched off while you move between rooms etc. Received mine today. All factory sealed literally brand new. Registered the warranty and got 2 years instead of 1! Received mine today. All factory sealed literally brand new. Registered …Received mine today. All factory sealed literally brand new. Registered the warranty and got 2 years instead of 1! Mine was the exact same in terms of packaging and literally as if it was brand new without a mark on the box. The invoice even shows the original price marked down to the discounted one. Does anyone think that the units Dyson provide could be customer returns that may have not been used? Mine was the exact same in terms of packaging and literally as if it was …Mine was the exact same in terms of packaging and literally as if it was brand new without a mark on the box. The invoice even shows the original price marked down to the discounted one. 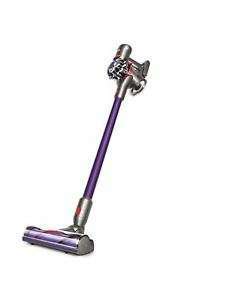 Does anyone think that the units Dyson provide could be customer returns that may have not been used?